Fabbio had to play a song that used short notes during surgery to avoid putting too much pressure on his brain. Brain surgery requires delicate and precise use of surgical instruments. But for Dan Fabbio it also required a different kind of instrument—a saxophone. Fabbio, 25, was working on a master's degree in music education when he stopped being able to hear music in stereo. He was soon diagnosed with a benign tumor located in the part of his brain known to be active when people listen to and play music. His surgical team, led by Dr. Web Pilcher, chairman of neurosurgery at the University of Rochester (N.Y.) Medical Center, and his colleague Brad Mahon, a cognitive neuroscientist, spent six months studying the functional and structural organization of Fabbio's brain. Fabbio was given a series of functional MRI scans during which he was asked to listen to music and hum back the melodies. Data collected during this process helped researchers pinpoint the areas of his brain crucial for music and language processing, and then were used to create a 3-D map of his brain that served as a guide during surgery. Fabbio remained awake during the surgery, performing music tests that helped the surgeons identify which areas of the brain to avoid. Mahon developed the tests with Elizabeth Marvin, a professor of music theory at the University of Rochester's Eastman School of Music. 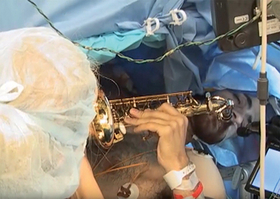 Once his tumor was removed, while still lying on the operating table, Fabbio was given his saxophone so he could serenade his surgical team as a final check that they had been successful. "He played it flawlessly, and when he finished, the entire operating room erupted in applause," Marvin said. "It made you want to cry."